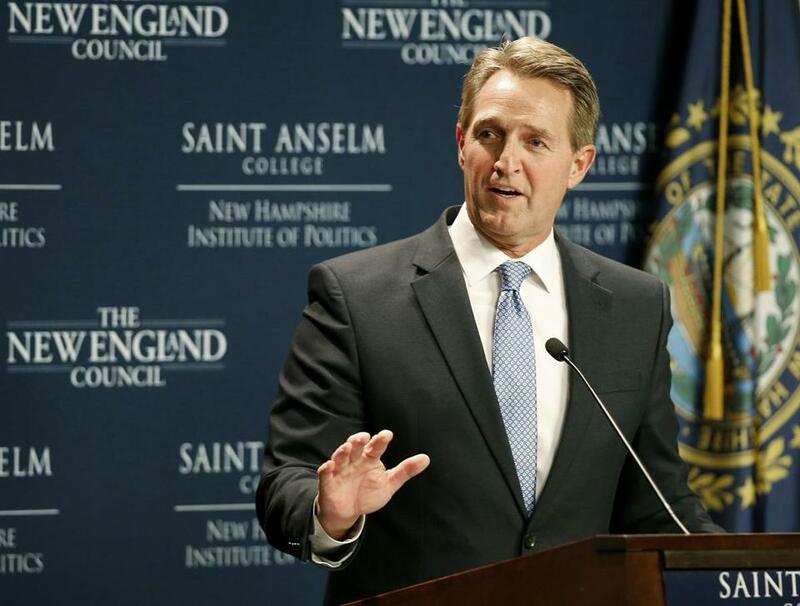 Senator Jeff Flake, Republican of Arizona, spoke at the New Hampshire Institute of Politics at Saint Anselm College in Manchester, N.H. Friday. Setting up what could be a primary challenge to the sitting president, Arizona Senator Jeff Flake delivered a blistering message in New Hampshire on Friday, accusing President Trump of hijacking the Republican Party with a “propaganda-fueled, dystopian view of conservatism,” while positioning himself as a staunch supporter of free-market, small-government values. The visit marked the first time Flake has been to New Hampshire — home to the first-in-the-nation presidential primary — since campaigning there with Arizona Senator John McCain in 2008. Often potential presidential candidates visit the state and play coy about their reasons for being there. Not Flake. His appearance at the Politics and Eggs breakfast, a must-stop for all potential presidential candidates, and his speech ripping Trump were not subtle. “We must turn away from this brand of poisonous politics,” he said. Flake is the first potential Republican candidate to visit New Hampshire since the 2016 election, leading off a flurry of activity that is unusual for the party in power. President Trump will be in Manchester, N.H., on Monday, his first time in the state as president. He will be followed three days later by Vice President Mike Pence. Ohio Governor John Kasich is scheduled to visit the state April 3. Flake, 55, said the “odds are long” that he will run for president in 2020, but he has “not ruled it out.” Kasich, likewise, has not ruled out running either as a Republican or as an independent. “I hope that someone does run in the Republican primary, someone to challenge the president,” Flake said. Flake was well received by about 150 attendees who comprised the business-minded crowd. The group gave Flake a standing ovation as he finished his speech. Neil Levesque, director of the New Hampshire Institute of Politics, which hosted the event, said he had never seen a standing ovation for a potential candidate at Politics and Eggs. Still, Flake is pondering a run for president after announcing last year he would not seek reelection to the Senate in 2018. He suggested in a recent interview that conventional conservative beliefs seem to be out of vogue. This is especially so, as Flake notes, because he has been a chief critic of the president. Last year, Flake released a book that was largely viewed as a screed against Trump. At the breakfast, Flake introduced himself as a real conservative who grew up on an Arizona ranch riding horses. He says he’s modeled himself after his political idols, Barry Goldwater, George H.W. Bush, and Ronald Reagan. Were he to take on the president in a primary, Flake would face a steep climb. The president remains popular among Republicans in New Hampshire, where Trump easily won the state’s 2016 presidential primary. However, there is room for a primary challenge should a traditional Republican, like Flake, want to try. A poll conducted last month by New Hampshire’s Saint Anselm College showed Trump with just a 36 percent approval rating overall. One in four Republicans polled don’t approve of Trump as president. A University of New Hampshire poll last November showed only 47 percent of Granite State Republicans were willing to say they would vote for Trump in the next presidential primary.